Nepal has notched notable successes in conserving nature: five years of zero poaching of rhinos and tigers in national parks, the doubling of the wild tiger population in 10 years and protection of plant species. However, roads, irrigation canals, transmission lines and even railways are now threatening to undermine these achievements. Conservationists say that balancing the need for economic growth with ecological protection will be even more challenging than combating poaching. As the country marks National Wildlife Week from 14-20 April, Nepal’s planners need to find ways to build new infrastructure without irreversibly harming the country’s biodiversity. Now that Nepal has domestic poaching under control, it needs to focus on controlling the transit of wildlife smuggling. Nepal is a hub for trafficking of tiger, rhino and pangolin parts from India and Africa. Even live chimpanzees and birds have been found at Kathmandu airport. 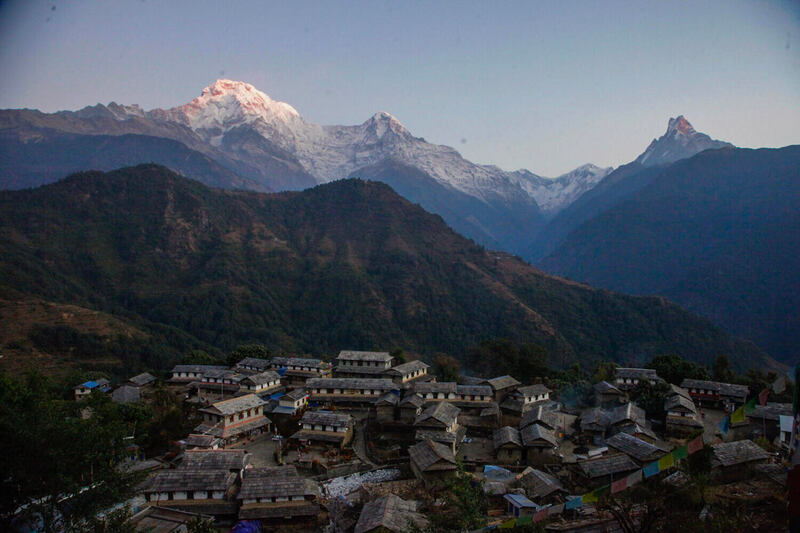 Nepal is now a victim of its own success in conservation. With poaching controlled, protected areas are now getting overcrowded with wildlife, leading to the threat of disease and an increase in human-animal conflict. ROADS AND ANIMAL KINGDOMS: A rhino wallows in a jungle pond in Bardia National Park, where wild elephants (below) regularly cross the E-W Highway. In addition, climate change is leading to weather extremes that have aggravated the problems of water scarcity, flash floods and prey decline. Even though rhinos are no longer poached, for example, there has been a sharp increase in fatalities, with 41 dead in the last 9 months alone in Chitwan. Besides old age, most have died of disease, fights with other rhinos, or poisoning. 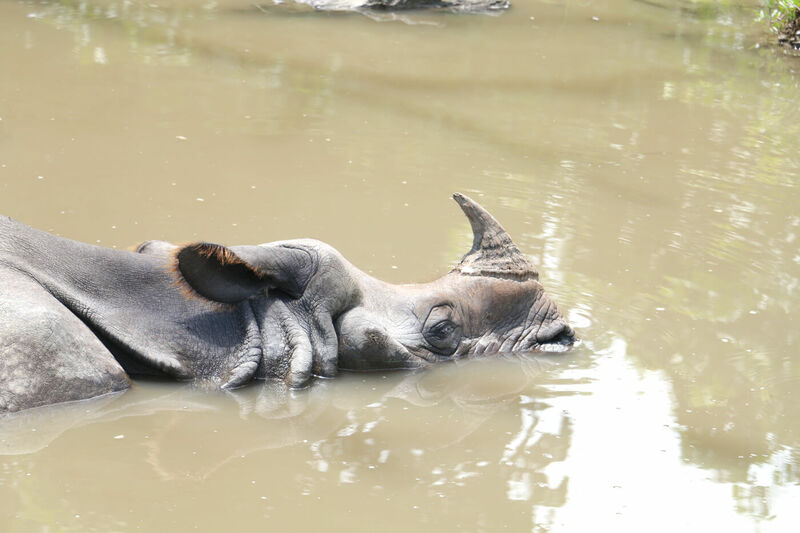 Last month, a rhino died in Sauraha after falling into the septic tank of a hotel. There has also been an increase in wild elephants and tigers entering human settlements in search of food due to habitat encroachment in their migration corridors. Last year, flash floods in Chitwan washed away rhinos: 12 of them had to be rescued and brought back from India. However, the biggest threat to Nepal’s wildlife in the post-poaching era is new infrastructure crisscrossing nature reserves. Major transmission lines have been built or are planned through national parks, the new postal highway slices through nature reserves, new irrigation canals such as Babai, Sikta and Ranijamara have bifurcated areas frequented by wildlife, and the new East-West railroad running parallel to the E-W Highway will fragment many national parks. 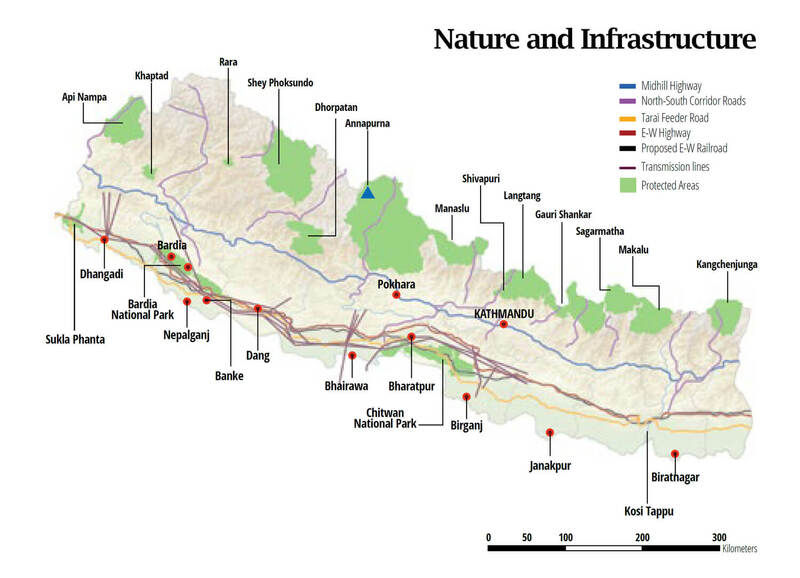 Nature reserves and national parks make up one-fourth of Nepal’s area. 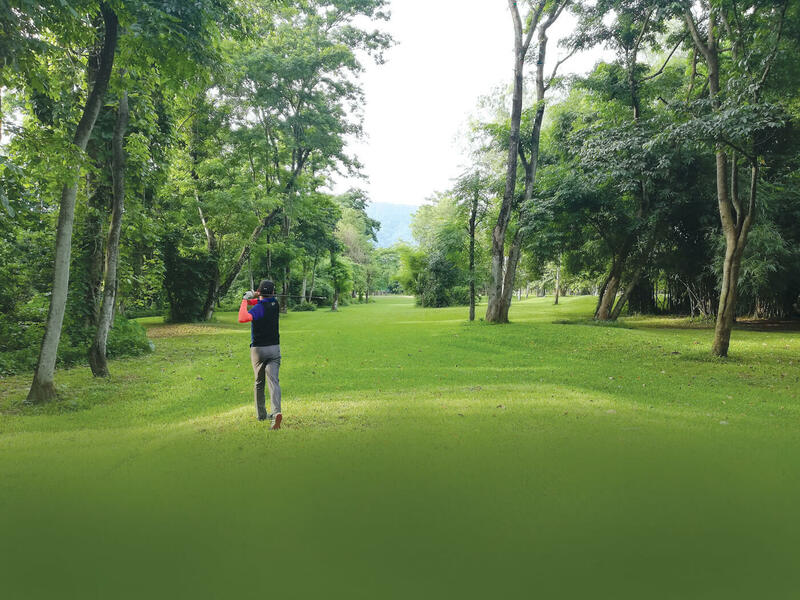 With infrastructure building spree currently underway, experts say the country will soon lose 200,000 hectares of forests. 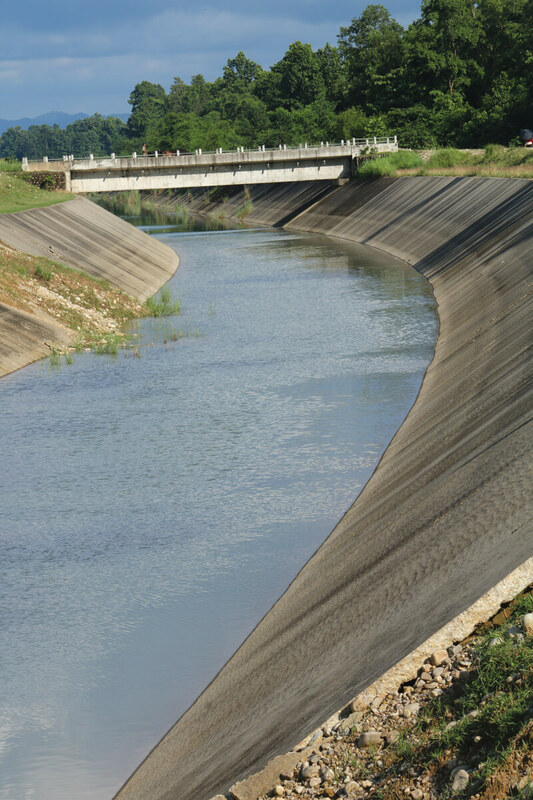 This will result in rampant habitat destruction, and increase in road kills and deaths of animal that fall into irrigation canals, which account for the highest number of wildlife fatalities. New roads have also brought haphazard urbanisation and pollution: a growing number of ungulates and carnivores have been found to have died after ingesting plastic or chemicals. One of the biggest sources of habitat destruction will be the much talked about Nijgad airport near Parsa National Park, which will decimate one of the last remaining hardwood forests in the eastern Tarai, removing a major migratory corridor for wild elephants. DNPWC and WWF Nepal organised a regional workshop this month in Kathmandu to find ways to promote sustainable green infrastructure. Some of the key recommendations include the study of wildlife movement before mapping the alignment of linear infrastructure, like roads, railways, canals and transmission lines. The good news is that planners at the Department of Roads think the country does not need too many more roads, the existing strategic highways and feeder roads need to be upgraded. There have been initiatives like installing CCTV cameras to monitor vehicles, enforcing time cards on highways that traverse national parks, as well as building over and under-passes so wildlife can cross highways, irrigation canals or train tracks. DNPWC is now planning five canopy bridges for arboreal species in Banke, and contractors have agreed to build new underpasses while widening the Daune-Narayangad section of the East-West Highway. 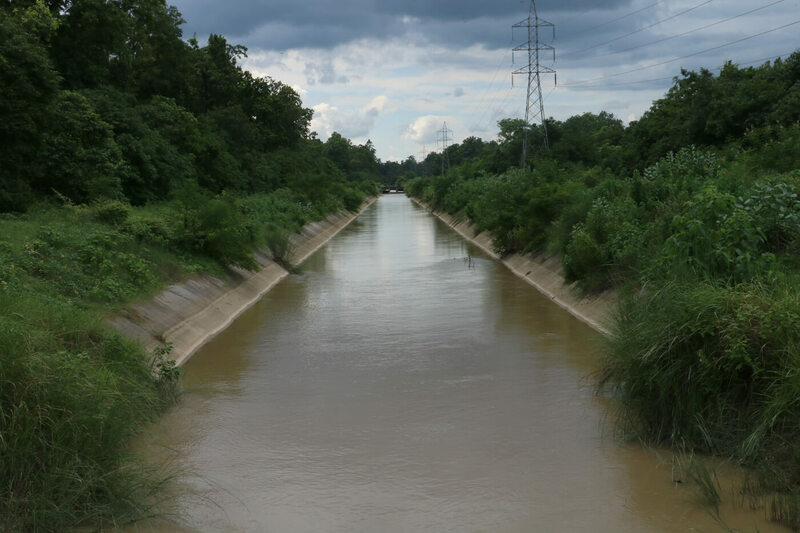 The route for the proposed E-W Electric Railway that would have cut through Chitwan National Park has been changed after protests from activists. But these isolated cases will not be sufficient to minimise the nationwide threat to nature reserves from infrastructure in the long run. Experts say wildlife friendly infrastructure based on biodiversity assessment and species movement is a must. 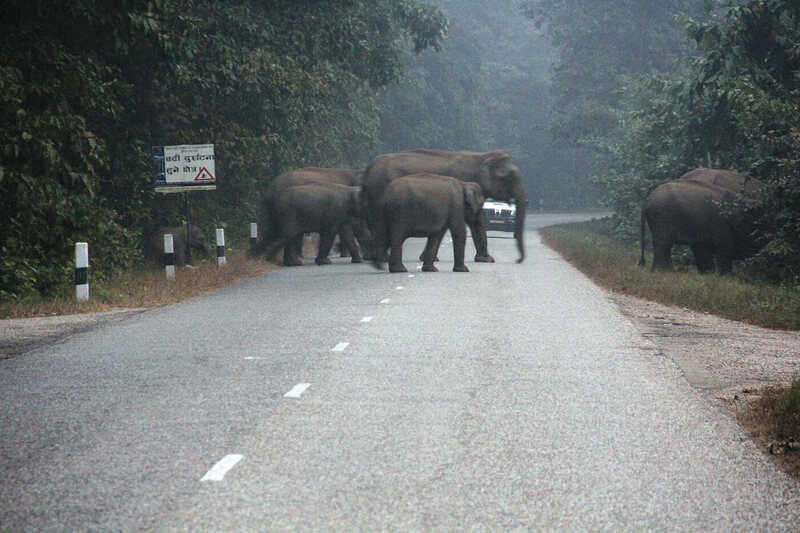 Nabin Gopal Baidhya of the non-government Wildlife Conservation Nepal thinks there may be too much emphasis on the impact of roads on national parks.